Astronomers have observed an exoplanet that varies in temperature by 700°C as it follows its highly elliptical orbit around its sun. In a study appearing in the journal Nature, scientists say they have generated the most realistic images ever captured of an exoplanet. They used infrared data collected from NASA's space-based Spitzer telescope to gain pictures of a strange world exposed briefly to an inferno. 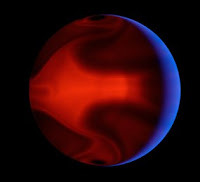 One image shows a thin blue crescent on the "dark" side of the planet, opposite its star, while the scorched side glows a deep, crimson red. Known as HD80606b, the planet is a giant ball of gas that has four times the mass of Jupiter, and is approximately 200 light years from earth. Researchers, led by Gregory Laughlin of the University of California at Santa Cruz, analysed data collected before, during and after HD80606b's closest approach to its star. From the telescope's vantage point, the planet passed behind the star - an event called a secondary eclipse - just before reaching its maximum temperature of 1227°C. It was an unexpected stroke of luck, making it possible to measure the exact temperatures of the star and the planet separately. "This is the first time that we've detected weather changes in real time on a planet outside our solar system," says Laughlin. "The results are very exciting because they give us important clues to the atmospheric properties of the planet." As the atmosphere heats up and expands, it produces fierce winds - moving at five kilometres per second - that flow away from the day side toward the night side. The planet's rotation causes the winds to curl up into large-scale storm systems that gradually peter out as temperatures cool, says Laughlin. HD80606b swings around its sun in an elliptical orbit every 114 earth days. It is one of about a dozen so-called "hot Jupiter" exoplanets which spin on their axes in such a way that the same surface is always facing their respective stars. The photo-like images were generated by a computer program that calculated the colour and intensity of light coming from the glowing planet. "These images are far more realistic than anything that's been done before for extrasolar planets," says UCSC researcher Daniel Kasen, who developed the program. When closest to its star, the sunlight beating down on the planet is more than 800 times stronger than at the far end of its egg-shaped orbit. "If you could float above the clouds, you'd see its sun growing larger and larger at faster and faster rates, increasing in brightness by a factor of 1000," says Laughlin. HD80606b was discovered in 2001 by a Swiss planet-hunting team at the Geneva Observatory. Approximately 300 exoplanets - some of which may have conditions similar to those that gave rise to life on earth - have been identified since 1995, but astronomers say far more are waiting to be discovered. Up to now, virtually everything known about the atmosphere of exoplanets has come from data collected by the Spitzer. I have a Kindle 2. Jealous much? OMG! Did Google Earth find Atlantis? Why do you own a Kindle? Can all that Twitters turn to gold amid gloom? How Green Are Disposable Diapers? How was the solar system built? Is there a Planet X?